credentis disclosed today that it has signed a non-exclusive distribution agreement with the Straumann Group for its non-invasive caries therapy CURODONT™ REPAIR. credentis’ unique product for Guided Enamel Regeneration will be launched as a key portfolio element for caries prevention and early caries treatment. Straumann, a global leader in esthetic dentistry, will begin a staged launch of CURODONT™ REPAIR starting in October 2018 in Germany, Italy and the United Kingdom, followed by other selected markets in 2019. The agreement enables credentis to make its non-invasive caries therapy with CURODONT™ REPAIR available to dentists and patients in some of the world’s largest markets. “We are convinced that this global dental leader, with its commitment to innovation and its novel preventive product portfolio, is the ideal partner to establish Guided Enamel Regeneration as a standard therapy for early caries.” says Dominik Lysek, CEO and founder of credentis ag. credentis ag will continue to sell the CURODONT™ product portfolio directly to its customers. Link to our European CURODONT webpage. credentis ag is headquartered in Switzerland. credentis has won multiple awards as well as support from organizations such as Genilem. Public grants include Swiss National Science Foundation (SNF), Aargauer Forschungsfonds and CTI in collaboration with the FHNW School of Life Sciences in Muttenz and the Medical Technologies IKC (in co-operation with the University of Leeds). Dr. Dominik Lysek, CEO and Michael Hug, CTO have a strong track record in science, development and medical technology, with focus in the dental industry. credentis board members Dr. Werner Berner, Dr. Michael Peetz, Gerard Moufflet and Dr. Erich Platzer (chairman) contribute their pharma, medtech and dental industry expertise. The Straumann Group (SIX: STMN) is a global leader in tooth replacement and orthodontic solutions that restore smiles and confidence. It unites global and international brands that stand for excellence, innovation and quality in replacement, corrective and digital dentistry, including Straumann, Neodent, Medentika, ClearCorrect, Dental Wings, and other fully/partly owned companies and partners. In collaboration with leading clinics, institutes and universities, the Group researches, develops, manufactures and supplies dental implants, instruments, CADCAM prosthetics, digital and orthodontic solutions as well as biomaterials for applications in replacement, restorative, esthetic and preventative dentistry. The patented CUROLOX® TECHNOLOGY is based on self-organizing peptides, which form a 3-dimensional matrix with high affinity for the dental mineral. In pure form, CUROLOX® TECHNOLOGY is used in CURODONT™ REPAIR as a crystallization nucleus for new hydroxyapatite crystals. This gives dentists a non-invasive way to regenerate caries lesions and similar dental defects – Guided Enamel Regeneration (GER). 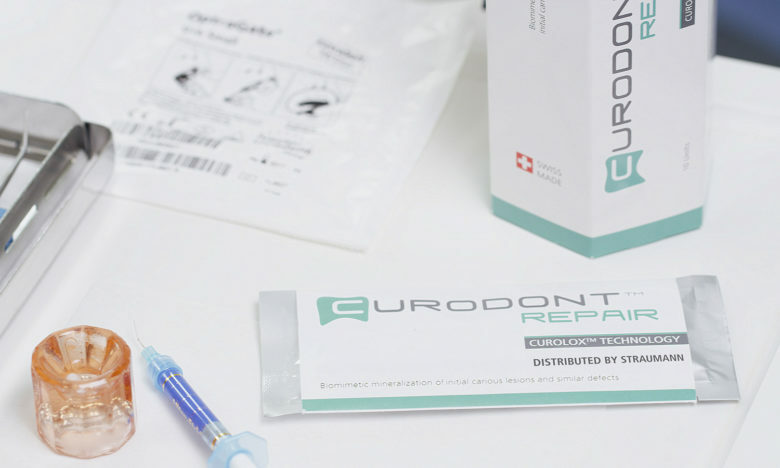 CURODONT™ D’SENZ is designed for the treatment of sensitive teeth. It utilizes the high bonding capacity of the CUROLOX® TECHNOLOGY to the tooth surface to form an effective protective barrier on the dentin. This quickly protects against painful stimuli. CURODONT™ PROTECT uses CUROLOX® TECHNOLOGY, to effectively protect the enamel against acid.